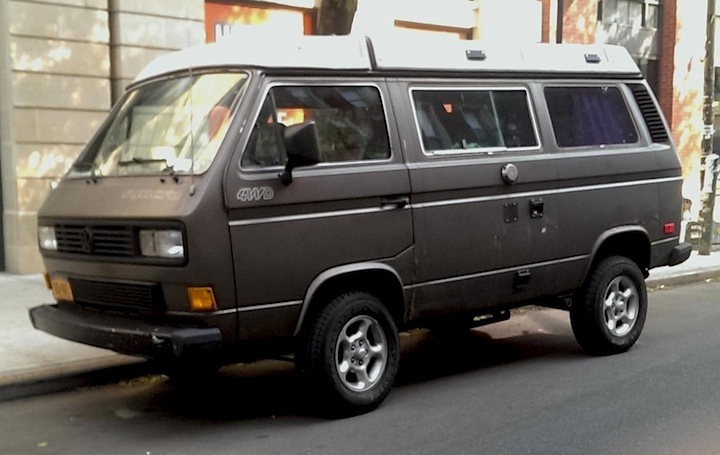 Yes, it does look like something you might see in a Mad Max movie, but this circa 1990 Volkswagen Vanagon Syncro Westfalia was spotted on the streets of Brooklyn last week by RealRides’ NYC photographer (a.k.a. my daughter Katie, who lives in The Bronx). That extra-long model name needs a RealRides breakdown: the Vanagon name came into being with the advent of the third generation (T3) VW van in 1979; Syncro refers to the four-wheel drive system installed by an aftermarket company in Austria; and the Westfalia part means it also has the camper conversion with the flip-top roof. The T3 was in production from 1979-2002, while the Syncro option was available from 1985-1992. VW is still producing a minivan (not on sale in the U.S.), the Transporter, which also offers a pop-up camper version called the California. — Jim Corbran, RRofWNY The post RealRides of WNY appeared first on Buffalo Cars.